Recent observations have confirmed that ALMA’s excellent sensitivity and calibration accuracy make it a top-class instrument for performing polarimetric measurements at millimeter wavelengths. 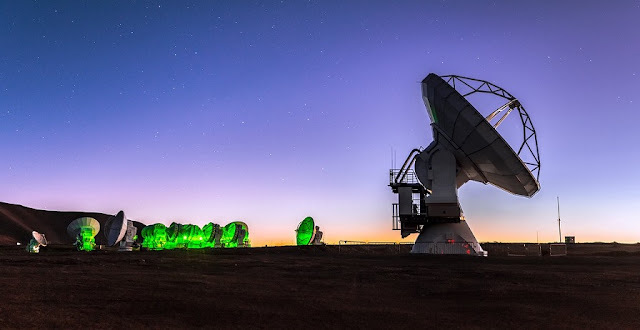 Even though ALMA (the Atacama Large Millimeter/submillimeter Array) has been operating since 2011, observations are continuing to verify key aspects of its performance. ALMA was designed to perform sensitive polarimetry — measuring the polarization of radio waves to reveal the properties of magnetic fields — and astronomers have recently reported the first full-polarization observations with ALMA, confirming that it is excellently suited to this task. To do this, astronomers observed the bright source 3C 286. A quasar lying some 7.3 billion light-years from us, 3C 286 is a very powerful source of radio waves and has been observed by many other telescopes. The radio emission from this object is known to be highly polarized, making it an ideal candidate to test ALMA’s capabilities in this area. The ALMA observations reveal details not seen before and clearly show that the magnetic field is stronger and more ordered towards the inner region of the jet that emerges from the quasar. This helps researchers to understand the magnetic field structure in the very heart of the quasar, furnishing vital clues about the physical processes that give rise to the radio emission. Magnetic fields are important in many cosmic situations but they are very difficult to measure. Polarimetry is one of the few methods able to reveal details of magnetic fields. However, the polarized component of the radio waves — the part measured in polarimetry — may only be a few percent of the total radio flux from an object, and therefore high sensitivity is essential to carry out precise polarimetry. ALMA has the sensitivity needed to make these crucial polarimetric observations, as this latest study has confirmed. These results were published in the Astrophysical Journal on 20 June 2016 in a paper entitled “ALMA Science Verification Data: Millimeter Continuum Polarimetry of the Bright Radio Quasar 3C 286” by H. Nagai et al.